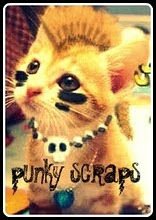 Welcome to Punky scraps blog hop! The design team and guests are back!! I've missed it during the brake and really look forward to all the funky punky challenges... :-) Hop around and you'll find prizes along the way, the best of them; a permanent place in the designteam! Yaaay!! 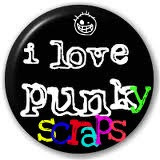 And of course you'll get loads and loads of inpiration! Hoppas att du haft/har en bra semester! Fantastic pages. I love all your details!! Very nice pages tks for the hop and for share nice ideas. Awesome pages. I like your techniques. Love love love your work Sara. Your style is awesome. So glad you are staying on the team. Wow love your work! So glad to see you back! Off i go a hopping we will go ! Underbart snyggt!!! Din stil har verkligen utvecklats! Jag var på Springsteen på Fredagen. Har sett honom förut men det var helt fantastiskt. Jag hade biljett även till lördag, men sålde den till sambons systerson. LOVING that first project! The red machine frame around the photo Fantastic!!! I constantly get ideas from your work- the flowers and gesso combos you come up with are always inspiring. so glad we are on this team together!!!! Vilka härliga layouter!!! Jag hade inte sett alla innan och blev verkligen inspirerad! Love your style! Lots of fun in each page!